First off, thanks to the consistently wonderful people over at Orbit for an ARC of ‘Bloody Rose (The Band #2)’ in exchange for an honest review. Receiving this ARC in no way, shape, or form influences my thoughts or opinions on the novel or its content. Well, needless to say, it was freaking epic as expected. There isn’t a doubt in my mind that Eames will be up for more awards as the months tick by, leading up to Book 3 and so on. To me, Eames is like the Ernest Cline of epic fantasy. He writes an engaging story-line full of epic battles, memorable characters, laughs aplenty, and more nostalgia than you can shake a dead cat at. Except with Eames, its a full-on rock show, featuring your favorite shredders, bassists, drummers, and yeah… even keyboard players, in the forms of mercenaries hired to battle it out with some of the most epic monsters ever imagined. WHAT THE HELL ELSE COULD YOU ASK FOR?!?!? Hubris, man…. It’s killed more heroes than monsters ever did. 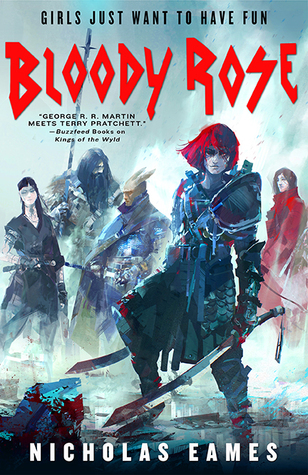 On the heels of the ever-popular KotW, we have Bloody Rose; but don’t let the title fool you. This is actually the story of Tam Hashford, a local barmaid who only dreams of acting out her own role in one of the many tales she hears from mercs and bards passing through her bar. Tales of fantastic adventures, epic battles, devastating carnage, and the above-all glory that comes from victory. That is, at least, until Fable, the most popular band across the Heartwyld since the days of Saga, shows up. Lead vocalist of Fable, the infamous Bloody Rose, offers Tam the opportunity of a lifetime: the chance to tour with them, in concert, across the Heartwyld as their new bard. Tossing away her old life and embarking on this epic adventure, Tam soon finds out that she is in for way more than she bargained for when her life is immediately thrown into the danger zone (thanks Kenny Loggins). Will she be able to save Bloody Rose from herself before Fable plays their farewell tour? I could seriously spend all day talking about how fantastic this novel is. About how you should pre-order it NOW or how badly you need to read Kings of the Wyld (The Band #1) if you haven’t already. About how fantastic these characters are, how expansive and jaw-dropping the world-building is, or how emotionally involved you as the reader will become while reading this novel. Or how this series, in my opinion, will go down as one of THE must-reads if you call yourself a fan of epic fantasy, or fantasy period. Maybe I’ll even tell you about the tears Eames made me shed, EVEN BEING THE MANLY MAN THAT I AM, because of how beautiful this story was. But I’m not going to do that because I have a job to get back to and people sort of depend on me to do that job. I’ll simply leave you with this and let you form your own opinion once you read Books 1 or 2, or both, and come back to tell me how right I was. Haha, absolutely. And yes, I figured I had to at least get ONE reference into my review. I loved KOTW, and while (almost) everyone goes on about how funny it was, it had a big heart too. Can’t wait to read this one. I’ve pre ordered and am impatiently waiting for it to be released.